Quick overview In this Very Short Introduction Ian Walmsley introduces the physics of light. Beginning with the earliest conceptions of the nature of light he traces the growth of our understanding, through competing particle and wave theories to wave-particle duality and quantum theory, and the latest exciting applications such as optoelectronics. Light enables us to see the world around us. Our sense of sight provides us with direct information about space and time, the physical arrangement of the world, and how it changes. This almost universal shared sensation of vision has led to a fascination with the nature and properties of light across the ages. But the light we see is just a small part of the whole spectrum of electromagnetic radiation, ranging from radio waves to gamma rays. 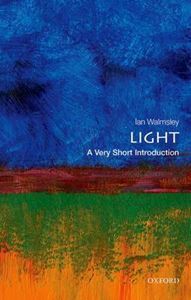 In this Very Short Introduction Ian Walmsley discusses early attempts to explain light, and the development of apparently opposing particulate and wave theories by scientists such as Isaac Newton and Christiaan Huygens. He shows how light was recognized as an electromagnetic wave in the 19th century, and the development of the quantum mechanics view of wave-particle duality in the 20th century. He also describes the many applications of light, domestic and scientific, such as microwaves, DVDs, and lasers. We now use the whole range of electromagnetic radiation to peer both into the human body and deep into space. Turning to the future of optics, Walmsley concludes by looking at some of the most exciting new developments using quantum light sources in communications and computing. ABOUT THE SERIES: The Very Short Introductions series from Oxford University Press contains hundreds of titles in almost every subject area. These pocket-sized books are the perfect way to get ahead in a new subject quickly. Our expert authors combine facts, analysis, perspective, new ideas, and enthusiasm to make interesting and challenging topics highly readable.